Allan Block is a customer service oriented company. 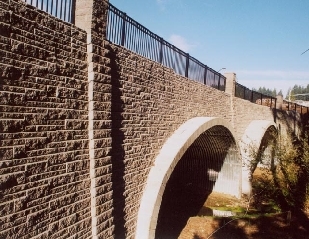 The Allan Block Engineering Department is a resource for engineers to help with technical and feasibility questions and preliminary design assistance for retaining wall and fencing projects. In addition, the engineers at Allan Block are available for AB Walls 10 software tutorials. AB Walls 10 is a comprehensive design tool that analyzes external, internal, and internal compound stabilities, then outputting professional quality construction drawings and technical support data. Click here to learn more about AB Walls Design Software..
To ensure that all components of the overall site have been considered, a local engineer must be employed. These local engineers, for a fee, will provide final stamped design documents which are based on their review of the actual site and soil conditions and their knowledge of all local codes. For Allan Block pricing, colors and product availability, contact your local representative.